Smoking cigarettes is a significant risk factor for many serious conditions, including heart disease, stroke, cancer, emphysema, and diabetes. Smoking also contributes to high blood pressure and low HDL ("good") cholesterol, which are themselves risk factors for heart disease. On average, the health risks from smoking shave seven to eight years off a person's life. Smoking causes more than a half million premature deaths worldwide each year. A smoker has a two to four times greater risk of sudden cardiac death than a nonsmoker. If a person has any other risk factors for heart disease, smoking dramatically increases his or her overall risk of a heart attack. 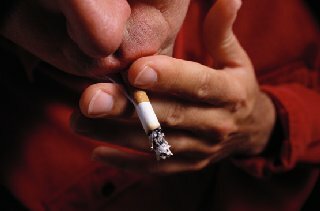 Smoking worsens the health of the smoker and the people around the smoker. Infants and children exposed to secondhand smoke develop more respiratory problems: bronchitis, pneumonia, ear infections, coughing, wheezing, and worsened asthma. Secondhand smoke can also cause heart disease and lung diseases in nonsmokers. Children of smokers are much more likely to smoke than children of nonsmokers. Pregnant women who smoke put their babies at risk for low birth weight, developmental problems, and even death. If you have ever tried to quit smoking and failed, you are not alone. Many people try to quit smoking several times before they succeed. Nicotine is a powerfully addictive chemical. However, three to four days after a person quits smoking, nicotine leaves the blood and cravings for cigarettes start to weaken. More than 60 million people around the world have quit smoking. You can, too! Your risk of a heart attack drops quickly (within days) as soon as you stop smoking. After two years of remaining smoke-free, your risk is nearly as low as a nonsmoker. When you stop smoking your body starts repairing itself almost immediately. The risk of heart attack, stroke, and cancer starts dropping immediately. Your cough becomes less and less severe. Food starts to taste better. Your sense of smell gets sharper. Your clothes will smell laundry-fresh. The nicotine stains on your hands or face will start to disappear. You'll discover you have a lot more pocket money. Take a brisk walk around the block. Call someone who has quit smoking and ask him or her to remind you about the benefits of a smoke-free life. Enjoy a bubble bath or soak in a hot tub. Time your urges to smoke. Most urges go away in two to three minutes, whether or not you give in to them. Get rid of all the ashtrays, lighters, and other smoking accessories in your home. Clean out the ashtray and remove the cigarette lighter in your car. If you feel agitated or irritable when you try to quit smoking, ask your family members or co-workers to give you a temporary "grumpy" license. Explain that you're trying to quit smoking and ask them to be understanding until the irritable feelings pass. Avoid alcohol. Drinking erodes your resolve and is often a "trigger" for smoking. Save all the money you would've spent on cigarettes  it will add up quickly. When you stockpile enough, treat yourself to a weekend vacation or shopping spree. Make a list of reasons for quitting smoking. Keep the list handy and refer to it often. If you need medical assistance to quit smoking, see your doctor. Nicotine gum, patches, and new medicines that make quitting easier are now available and may be an option for you. If you haven't decided to quit, try the following. Make a list of the reasons you would like to quit. Put each reason on a 3" x 5" card. Keep the cards with you and refer to them often. If you come up with more reasons, make more cards. Smoke one less cigarette today. Smoke two less tomorrow. Decide on a date to quit for good. Write it down on your calendar.